Welcome to the latest installment in our "All About Apps" series. 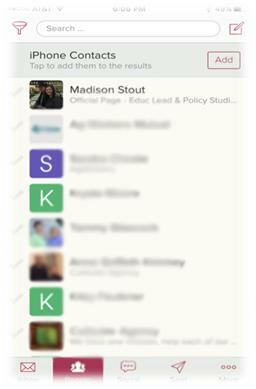 Cloze is an app created to help alleviate the stress of managing all of your interactive contacts. Its basic role is to compartmentalize all of your emails, phone calls, meetings, notes, and social media with regards to the people you come into contact with. It then sorts and automatically keeps track of information for its users to keep them prepared. It’s multi-functionally on different platforms including an app version for phones and tablets or a login for the computer. This app was created in 2012 by Dan Foody and Alex Coté out of Cambridge, Massachusetts. Their goal with the app as they put it was to “…unlock your “relationship gold.” They want the app to give you the best and easiest relationship with your contacts. Does this app do that? Read further down to see my opinion on how this app helps you stay “Cloze” with your contacts for real or if the name is just an incredibly good play on words. When you first get the app you are able to log in either with your Twitter, Google, Facebook, or email. I opted to login with my Google account and it was a simple login because I didn’t have to enter all of my information. Just like that Cloze automatically complied all of my emails together and started developing contacts with the people I had emailed the most. From there I was able to add my social media accounts and notes to my Cloze account and it continued to organize all my data. I could log in and out easily and I felt that my information was safe because it always asked me for my permission. Within Cloze there are numerous functions that could be accomplished depending on what you decide to buy. When I downloaded the app it was completely free and that included an email manager, organization of my contacts, a search system, and a social media option. Along with that came a 14-day free trial to all the options that Cloze could do including call history, tracking, follow-up reminders, calendars, signature analysis, morning briefings, and merging, integrating and syncing of just about anything. To be honest, I was a little overwhelmed because it was like an information overload and I wasn’t even sure where to begin. After monkeying around with it, the app consistently became easier to function because individual compartmentalized sections organized everything for me. I determined it could plan social media posts, organize the importance of my contacts, easily stay connected, and track a timeline of my work. Cloze also sent me notifications regarding events I had, projects I was involved in, and if I had scheduled any social media posts it notified me when it was published. A negative side to Cloze is that it was difficult for me at times to locate a particular item I was trying to find. What’s My Bank Account Going to Look Like? After my 14-day free trial was up, Cloze notified me and asked if I wanted to keep my upgrade “Cloze Pro.” If I didn’t keep the upgrade they would switch my account to strictly the free stuff. Cloze Pro is $13.33/mo. with the bill coming annually or you can pay $19.99 per month. There is also a business option that caters to keeping employees in sync. Cloze Business is priced the same. At first I thought that the price was a little steep. But when I really thought about how it was about $160 annually to basically organize my whole life (business and personal), it didn’t seem so bad and my opinion was changed. Being a college student I found that this app isn’t for people my age. The average college student doesn’t have enough relationships and contacts to have an app to keep them all straight. So I didn’t really find it useful. But, people who work in a job where they have relationships with numerous clients and employees will find the most value out of this app. You will have a way to simplify your multi-faceted ways you communicate with people, and better enhance your projects, social media and communication if you are willing to pay the price. All in all I think that this app lives up to its punny name and I think that it’s worth the time, money and storage space if you are looking for something to help you track your contacts and communication. I don’t see this app fading away with the new digital age. On the company’s blog, employees are continuing to make better changes to streamline the app and make it more efficient to compete with the society’s needs and it seems to be paying off. If you are interested in obtaining the app you can find it on the app store for iPhones, iPads and for Androids. You can also start an account at www.cloze.com. Madison Stout, from Ponder, Texas, is studying agricultural communication at Tarleton State University. You can message her at madisonstout01@gmail.com.